In helping you to identify spiders, it helps to know what a spider is and is not. The study of spiders is known as "Arachnology." Spiders are invertebrate animals in the phylum Arthropoda, which is a large group of animals with jointed legs and a hard outer skeleton. More specifically, they belong to the class know as Arachnida or more commonly referred to as Arachnids. The Arachnids compromise the largest non-insect class of arthropod animals on earth. This includes around 75,000 known species of arachnids worldwide, and about 4,000 in North American alone. The class Arachnida includes almost a dozen orders, including Araneae (spiders), Scorpionida (scorpions), Pseudoscorpionida (pseudoscorpions), Opiliones (daddy-long-legs), Acarina (mites and ticks), Uropygi (whipscorpions), and Solpugida (windscorpions). There are around 3,000 species of spiders alone in North America, and new species still remain unidentified by science. Given that overwhelming number, we will cover only the common species in detail. When trying to identify spiders, it helps to know they all have some basic things in common. All arachnids have 4 pairs of legs, no antennae or wings, and only 2 main body regions, a cephalothorax and an abdomen. The cephalothorax is a fused body segment made up of the head and mid-body where the legs attach. In spiders, the abdomen is attached to the cephalothorax by a narrow stalk. The jaws of spiders, also called chelicerae, open forward in some species and to the sides in others. The jaws are tipped with fangs, with a duct from the venom gland opening at the end of each fang. Another key to help identify spiders is to also notice that they have leg-like structures called "pedipalps" between their jaws and the first pair of legs. These are small, looking like shortened legs in females and young, while in the males the tips are enlarged and often bulbous. The male spider uses the pedipalps to fertilize the female during mating. One classic feature that most people use to identify spiders is the presence of silk. This is produced by organs known as spinnerets located at the end of their abdomen. Though all spiders have them, not all spiders spin webs. What are spiders good for? Spiders provide vital control of the invertebrate population. They are skilled and efficient hunters of insects. 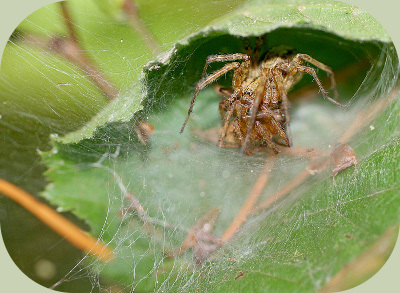 Spiders also feed a wide variety of other wildlife, such as frogs, toads, turtles, birds, bats and other small mammals. If you find a spider in your house, remember that it is just trying to survive. In some situations, spiders can help reduce destructive indoor insects such as moths, roaches and flies. If you do not want a spider in your house, please remove it gently by guiding it into a jar and taking it outside. Spiders are also a source of a variety of scientific research including research on animal behavior. In some parts of the world, spider webs were used as a dressing for wounds or even as a fishing net. In the past, spider silk was even used for crosshairs in microscopes and telescopes. Spiders also provide an excellent look into the diversity and richness of life on our planet. When you learn to identify spiders, you might start to see just how diverse and varied they are as animals. Where do I find spiders? Among debris: fallen leaves, branches, building materials. In the nooks and crannies inside your house. No matter how clean a house is, there is likely a spider or two living within it somewhere. What tools do I need to identify spiders? When you set out to take a closer look at these wonderful, eight-legged creatures it helps to have a few items with you. The most important is a hand lens or magnifying glass. This will allow you to look much more closely at the details of a spider's body and web. Getting to know and identify spiders found around you often means getting up close and personal. If that makes you nervous, remember the spiders are not out to get you. They are generally delicate animals with amazing lives and unique appearances. Even so called "dangerous" species with powerful venom can be observed with respect and care. 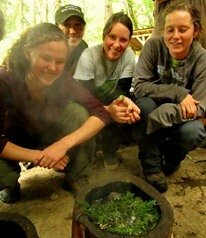 One of the most important tools in helping you to get to know spiders is your attitude. Do not do anything to put yourself or the spider you are observing in danger. Approach them with respect, consideration for their needs. You might just find that they can inspire in you the wonder of a child! It also helps to have a clean, glass jar into which you could place the spider for closer inspection which will help tremendously to identify spiders. This is especially useful with species that are active and might run away when you get closer. If you find a spider in a web, please try to observe it as much as possible without disturbing the web. It is hard work for a spider to make a web, and many species depend on webs to catch their food. If you do end up collecting a spider for observation, remember to be gentle. Spiders are fragile animals and are easily hurt by careless handling. Another helpful tool is a good field guide to spiders, such as those provided by the National Audubon Society or the Golden Guide series. For more details on these, visit the resources section at the end of this article. What key features should I look at to help identify spiders? Notice the overall silhouette of the spider: Does it look stocky with short, thick legs? Is it thin, with long legs, and an elongated body? Is the body small, and the legs extremely long, thin and stretch far from the body? Is its abdomen large and thick, while its legs are long and thin? Notice the overall color: Is the spiders body and legs solid gray? Does the spider have bands of darker and lighter brown and tan colors? Are there any areas of red, green, yellow or black? Notice the texture of the body and legs: Are the legs covered in dense, soft looking hairs or are they more sparse and spiky? Does the body appear smooth or furred, does the body look spiky or rounded? When you look at the cephalothorax (head and midsection), what color is it? What pattern does it have on it, if any? What about the abdomen? What colors and patterns do you see on it? Does the abdomen appear round, elongated, triangular, rectangular, made up of large spiky projections? Is it large, relative to the overall body or small? 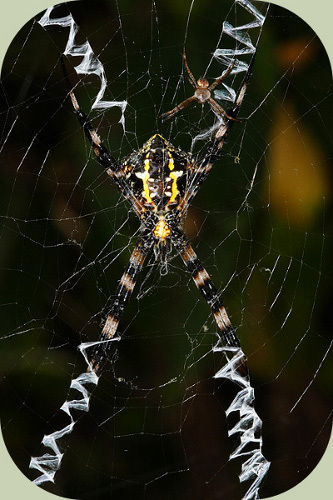 Female spiders tend to have larger, thicker and more developed abdomens than males. Do the legs, look like they are relatively equal in length, or do some pairs appear longer than others? If some are longer, where are they located? Look at the fangs. What shape, color and texture are they? Long or short? Large or small? Now with a magnifying glass or hand lens, look really closely at the spiders' eyes. How many do you see? Where are they located? How are they grouped? Are some bigger than others? Look at them from as many angles as you can. The location, groupings and sizes of eyes will help you tremendously in narrowing down spiders into possible groups of species. Do you see the spider in or near a web? If so, what shape and size is the web? Where is it located? When you try to identify spiders on your own, it might be helpful to look at some of the most common and well-known species. 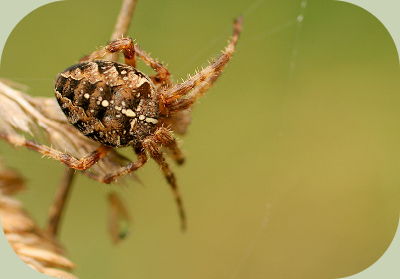 Species: Among the most well-known spiders are the orb-weavers (Araneidae). One of the most common is the cross-orb weaver, pictured below. Size: The female has a large body (up to 3/4” long total), and is significantly larger than the male. Diversity: There are around 160 species in North America north of Mexico. Description: When you wish to identify spiders of this species, remember they are generally tan, with darker brown bands on the long legs and across the abdomen. There are also small, white marks that form repeating patterns across and down the length of the abdomen. These often form a white cross near the front half of the abdomen. The eyes are all the same size and are arranged with 2 pairs being one above the other directly at the front of the face, and the other 2 pairs positioned one on each side of the first 2 pairs. The argiope spiders have a very similar arrangement, only the first 2 pair of eyes is more separated and slightly larger, with the top pair of eyes being further back on the head. Hazard: Their venom is harmless to people, and they are non-aggressive. Comments: They hunt using their webs to catch food, have poor eye sight and feel for the vibrations of their prey on the web. Species: A group of well-known and common members of the orb-weavers are the argiope spiders or St. Andrew's cross spiders (Argiope sp.). Size: Vary from 1/5" to up to an 1" long in body length. Males much smaller than females of same species. Diversity: See the orb-weavers above for info. Description: To help identify spiders in this group, notice that the legs tend to be very long, and the abdomen is large and elongated, often with bright, contrasting colors in bands or large blotches. The males are much smaller than the females, and one can be seen in the photo if you look closely. Hazard: These species are not know to be dangerous to humans. Comments: These species build large webs, often with a pattern of thick, white webbing near their centers. Some species will shake their webs when disturbed. The white patterns of silk on the webs near the spider can make it look much larger and more intimidating when it is moving rapidly. A few species are also called St. Andrew's cross spider because of the white silk filaments that form a cross in their webs, as you can see in this photo. The legs of these creatures also create that same pattern (which looks like an large 'X') and noticing this can help to identify spiders in this group. 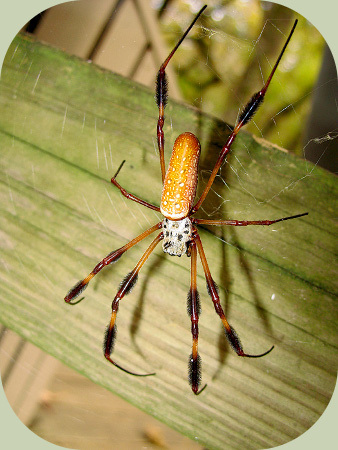 Species: The largest members of the orb-weaver family are the golden orb-weavers (Nephila sp.). These are mostly tropical and sub-tropical species found in the southern U.S. and southward. 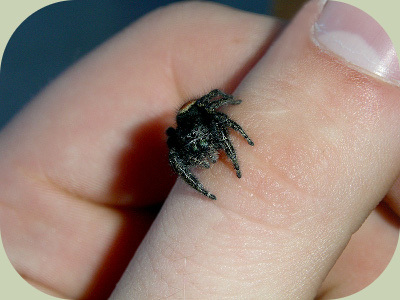 Size: The female can reach a body length of 1” and leg span of 4” or more. Males are about 1/5" in body length. Diversity: The only species currently known to exist in the U.S. is the golden silk orb weaver (Nephila clavipes) which is pictured below. 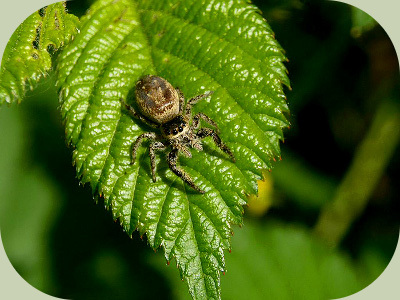 Description: Size is definitely one of the keys in helping you identify spiders of this group. A obviously large, very long legged spider with a golden-yellow abdomen, and grayish cephalothorax. Legs are yellow with black bands and tufts of black hair. Hazard: The venom of these species is powerful, but not generally thought of as dangerous to humans. The bite can cause localized pain and some blistering, though this generally resolves after 24 hours. Comments: The webs of these spiders can be huge, some to over a meter across! Species: Another group of spiders is the funnel weaver (Agelenidae) family, which create a sheet of webbing over the ground, vegetation or other objects with a funnel at one end where the spider hides. Size: Average between 1/4" to almost 1" in body length. Diversity: There are around 500 worldwide, about 300 in USA. Description: Generally, these spiders are long legged, hairy, with brown and tan stripes and patterns on their bodies. One of the keys to identify spiders in this group is found by looking at the eyes. The eyes are clustered very closely together on the face, and all of them are the same size or nearly so. Hazard: The bite of the hobo spider can cause localized pain, swelling and necrosis (specifically a small wound may form where the venom has destroyed tissue, and will take a long time to heal). A common symptom is also a painful headache. Hobo spiders are not generally known to be deadly. The spider in the photo is a female of a harmless forest dwelling species of funnelweb. If you look closely, you can see she is consuming her mate! Comments: The spider sits and feels for the vibration of insects walking on the web. When it feels them, it rushes and grabs the prey, then carries it back to its funnel. Most people see the webs of these species on moist mornings, when dew makes them stand out in lawns and other grassy places. Some species in this group live in and around houses, sheds and garages. This includes the hobo spider (Tegenaria agrestis) which is potentially dangerous. This spider was introduced to the Pacific Northwest along with the giant house spider (Tegenaria saeva) and common house spider (Tegenaria domestica) from Europe. Species: Among the most common spiders are the members of the wolf spider (Lycosidae) family. Size: Often between 1/8" to 3/8", but some species reach 1" in body length. Diversity: Over 200 species of wolf spiders north of Mexico. Description: You can identify spiders in this group by noticing the details of there bodies closely. These spiders tend to have long legs and somewhat elongated and furry bodies. The eyes of these species are cluster at the front of the face, with a pair of enlarged eyes and two smaller pairs of eyes underneath the large ones. The last pair is position further to the rear of the head. The body is often stripped in brown and tan patterns, and species are colored to match their specific habitats. Hazard: These species are generally non-aggressive, though the bite of certain species can be hazardous to children or the elderly. Comments: When you want to identify spiders in this group, remember that they are first of all not attached to their webs. These species can roam significant distances over open ground. Some of them dig tunnels or deep burrows, which are used as a safe retreat when resting. Wolf spiders are often the most numerous species in open country, as well as on high mountains. They are even found up in the Arctic region. 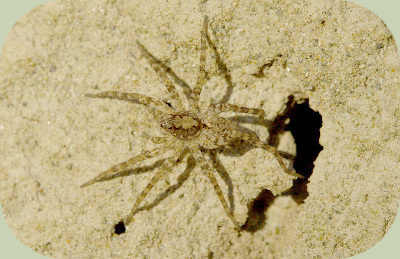 The species in this photo lives in an open, sandy area near a river, and is most likely a member of the thin-legged wolf spider group (Pardosa sp.). 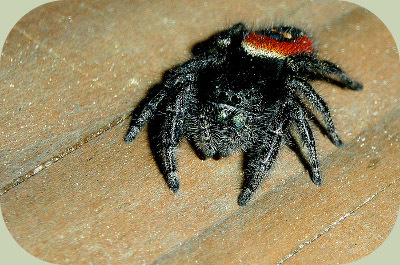 Species: Some of the most beautiful and captivating spider species belong to the jumping spider (Salticidae) family. Size: These spiders are generally small, most less than 1/2" long. Diversity: There are about 300 species found north of Mexico. Description: Most of these spiders have bright, contrasting colors some even with iridescent patches. Members of this family have a stout, squat look often with short to medium length legs and thick, somewhat elongated bodies. The face of these species is distinct and can help identify spiders in this group.They have a pair of very large eyes at the front of the face, and slightly smaller on each side of those. The other 2 pairs of eyes are separated out onto the middle and back side of the head region of the cephalothorax. Hazard: Jumping spiders are not generally considered hazardous, they are non-aggressive. Comments: These species are active hunters, which do not hunt using webs. Rather, they explore a wide variety of habitats including leaves, tree branches and trunks, rocks, walls, windows and many other surfaces. They walk or jump and walk as they move along in search of prey. When prey is spotted, they will stalk as close as possible and then leap onto the prey with great skill. Members of this family are not known to be dangerous to humans. The only spider known to eat mostly vegetable matter is in this family (please see the link at the end of the article). The species in this photo is the boreal jumping spider (Phidippus borealis). 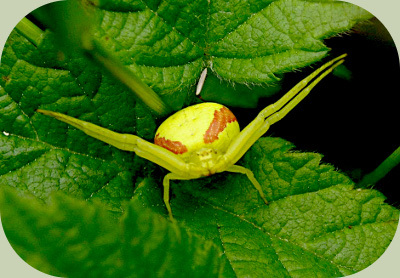 Species: Another common and attractive spider is the goldenrod spider. This is a member of the family known as the crab spiders (Thomisidae). Size: Large species around 1/2" long, many smaller species around 1/5" long. Males smaller than females. Diversity: Around 128 species in the USA. Description: One of the keys to help identify spiders in this family is the way the legs are arranged, outstretched to the side. The legs are so that the first and second pairs are longer and thicker than the third and fourth pair. Another family of crab spiders (Philodromidae) have only slightly longer legs in the first 2 pairs. The eyes are small, arranged in pairs at the front of the face and are placed on slightly raised ridges in some species. Hazard: Not known to be dangerous to humans. Comments: Crab spiders can move forward, sideways or backward. These spiders do not use silk to capture prey. Instead, they are sit-and-wait predators. Often, they wait near an area that is likely to attract prey and grab them when they come within reach. 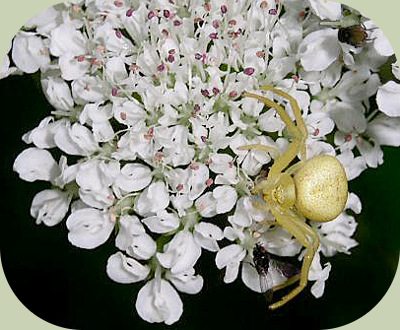 The species in the photo is one of the most widespread species, known as the goldenrod spider (Misumena vatia). This species is known to be able to change color from white to yellow in order to better match its surroundings. 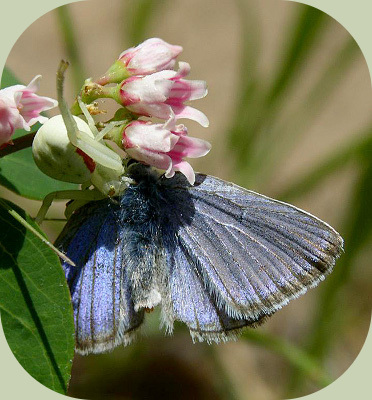 It is pictured with the blue butterfly it captured, that came to drink from the dogbane flowers. Same species in the second photo, head on view. There is a wealth of other species of spiders to be found and identified. Since only a few species have been included here, I recommend using other resources to help you identify spiders you might find.